Product #5577 | SKU CPR-201 | 0.0 (no ratings yet) Thanks for your rating! The Hosa CPR201 Stereo Interconnect (1m). This cable is designed to connect gear with stereo unbalanced phone jacks to gear with stereo phono jacks. It is ideal for connecting pro audio gear to consumer audio components. 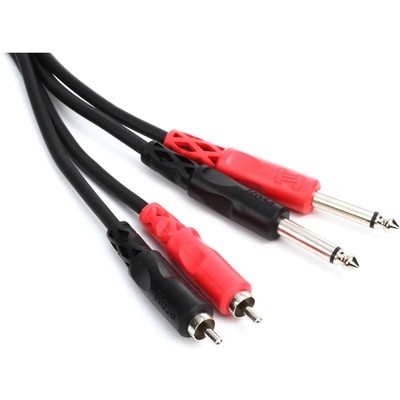 This Cable features two unbalanced/mono 1/4" male plugs at one end and two RCA male plugs at the other end. The CPR-200 series features Hosa's own injection-molded cable terminations. Ideal for Left/Right stereo applications.